Enjoy a limitless universe of high definition digital music through your existing Hi-Fi audio system. bluMe streams the highest quality audio wirelessly from your Bluetooth enabled device to any music system or powered speakers. It's a true high fidelity component that uses high-end aptX / AAC audio streaming codecs and audiophile grade DAC to unleash all the clarity, crispness and full emotional impact your Hi-Fi stereo system can deliver. Unlike standard Bluetooth receivers, bluMe provides ultimate wireless freedom with the longest wireless range. bluMe is more than a Bluetooth music receiver; it’s also a Digital to Analog Converter (DAC). Digital tracks are simple sequences of code. To turn this code into a signal that speakers can recognize, you need digital-to-analogue converters (DACs for short). bluMe features the world renowned 'Miracle DAC' AK4396 by AKM. It’s a true Hi-Fi 24bit / 192kHz upsampling audiophile DAC sporting a high SNR of 120dB that is well regarded for its impressive low noise and low distortion characteristics. In short, this means that the sound you hear is crystal clear, rich and retains a wonderfully full dynamic range. bluMe applies the latest in Bluetooth technology, the Bluetooth 4.1 to stream any format of music from your smart device, laptop or PC. Most devices use the basic SBC Bluetooth music codec. While this may be okay for some, but if you want great quality, it's simply not good enough. bluMe uses Advanced Audio Coding (AAC) and aptX, a superior performance digital audio codec. This combination of advanced hardware and firmware preserves all the musical detail, dynamic range and full bandwidth response, bringing out the best possible sound from your digital sources, for a sound that is far superior to standard Bluetooth streamed music. The delay between your TV and speakers is a common problem within many wireless audio solutions. 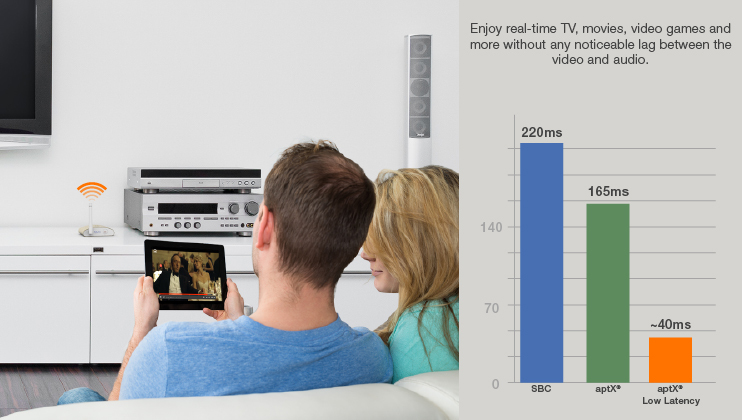 With bluMe, enjoy great movies knowing that picture and sound will always sync perfectly. bluMe features the latest aptX Low Latency technology that reduces this latency down to less than 40 ms, eliminating lip-sync issues to give you the smoothest audio/visual experience available. 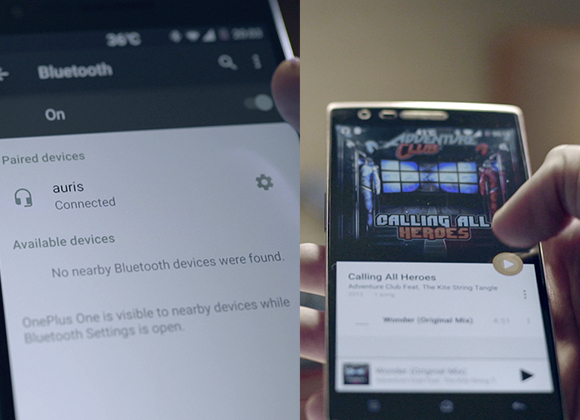 Limited range and signal dropouts have traditionally plagued Bluetooth audio systems. To combat this issue, bluMe employs special circuitry and a precision-tuned external high gain antenna to extend the wireless range, ensuring consistent, stable, strong, and glitch-free performance for 30 meters (100 feet), providing much more versatility than other Bluetooth receivers. bluMe's cutting edge technology maintains a robust and balanced wireless sound experience that is unaffected by interference from surrounding wireless networks. This results in superior 24-bit, upsampled audio that will completely redefine your perception of wireless sound. bluMe has two high quality gold-plated RCA jacks that operate as analog outputs. Any audio system with a standard analog audio input can connect to bluMe with the supplied RCA-RCA signal cable. For systems that have 3.5mm “mini” jack input, use the supplied RCA-mini cable. bluMe also features a Digital Optical (SPIDF) Out so that you can connect to an outboard DAC or the digital input of a surround receiver, giving you a 100% pure high-res digital signal through to your sound system. Pairing any smart device to bluMe is a breeze. Simply push the control button on the front of the unit briefly and it automatically goes into pairing mode. Activate Bluetooth in your smart device, select "auris bluMe " from the list of available devices and you’re ready to rock! 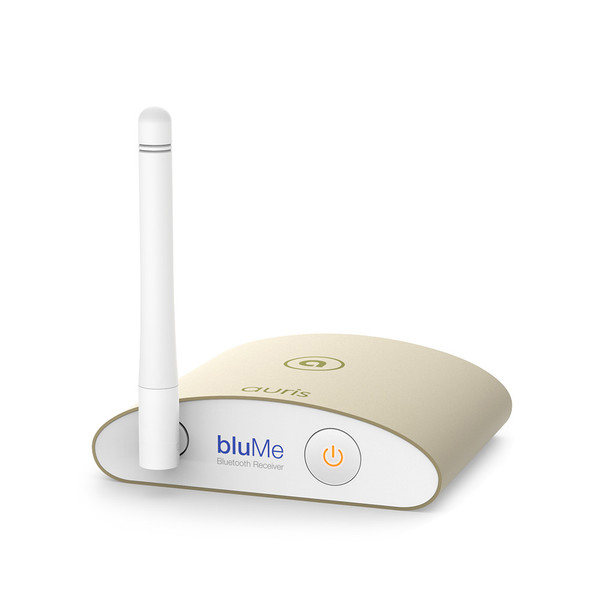 bluMe can connect to one smart device at a time, but is capable of remembering up to 8 devices. When more than one device needs to stream through bluMe, just turn Bluetooth off in the first device, turn Bluetooth on in the second, and select "auris bluMe " as the device. There is no need to reset bluMe and press its control button a second time once the device is stored. Even powering bluMe is easy. Draw power from a wall socket, or from the included USB cable, which means you can power it directly from your PC, Laptop, and more recent TVs and sound systems. bluMe can play any audio source a Bluetooth enabled device can access, opening up a virtually unlimited universe of music to enjoy through your Hi-Fi audio system. So you’re always in control not just of the music that’s stored on your device but also access music streaming services such as Pandora and Spotify, internet radio stations, podcasts and even music libraries connected to a wireless home network...all instantly, wirelessly in Hi-Fi quality. PLEASE NOTE that this product comes with a US wall plug, but can also be powered via USB.